Umbrella strollers fold up just like umbrellas, hence the name. 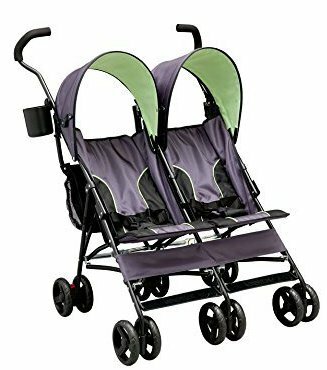 They are much smaller than full-size strollers, and they might not also be so feature-packed, but they are perfect for travels, grocery store trips, taking public transportation, etc. They are more portable and will easily fit in your car trunk, and you can also take them on the airplane. There are apparently many options on the market, but only a few of them meet the cut, and that’s why we are just focusing on the best umbrella strollers for 2018. We have also included a buying guide to help you make an informed decision. However, be careful when carrying your little one in any stroller you decide to buy because they cause thousands of injuries every year. You will need to lift and carry the umbrella stroller each time you use it, and most of these time you will have the baby in your hands, weight should be a significant consideration. A lightweight, but sturdy stroller is the best, and it’s even better if it has a carrying strap. A stroller is only useful if it’s maneuverable. The ease of maneuverability is greatly determined by the type of wheels and the type of terrain they can handle. Choose large and strong wheels. The ease of folding and unfolding the umbrella stroller is another significant factor to consider before making your order. Some are easy to fold or unfold one-handedly while others require some efforts. Also, the best umbrella stroller should fold compactly for easy storage, and it should be designed to stand on its own even when folded for convenience purposes. Your baby will only love the stroller if it’s comfortable for them. Thus, the seat should be well-padded, and it should also have a good back and side support to give the baby a place to lean on when they nap. You will be pushing this stroller, and it will be good for you if the handles have the perfect height for your height. Again, to have a comfortable experience, ensure that the handles are padded. You will obviously need some essentials even when going on short trips and so your umbrella stroller should have easily accessible storage. The best umbrella stroller should be easy to assemble and take apart when need be. Strollers with reclining settings are more comfortable than those without because they allow the baby to lean back or sit upright comfortably. The other factors are weight limit, adjustable features such as the footrest, the size of the canopy depending on how sunny your area is and baby safety features such as safety harnesses. Why we like it: The Summer Infant 3D lite is the best umbrella stroller for the money. It’s packed with all essential features to make traveling easier, and we like the one footed and one-handed fold, the multiple-position seat that reclines for comfortable naps, and the secure shoulder strap. The wheels a large to take on rough terrain and the storage basket is spacious and easily accessible. It’s also the best lightweight umbrella stroller. 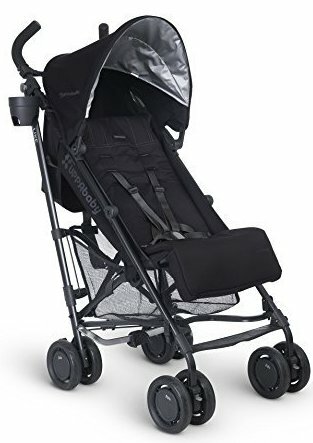 The Summer Infant 3D Lite is a lightweight yet sturdy umbrella stroller, and despite being way lower than most strollers, it has excellent features to make you and your baby enjoy using it. It has a multiposition seat that reclines to ensure that your baby is comfortable especially when they are taking naps. The seat straps are also easily adjustable to fit various babies securely and comfortably. You can change from one position to the other quickly, thanks to the two red buttons because they work better than zippers or straps. The lowest recline position goes pretty lower, nearly flat, thus giving the best position for napping and you only need one hand to push it back to an upright position. It’s a good umbrella stroller for tall babies. The seat is very comfortable because it’s well-padded and roomy. It also has a five-point harness, and the buckle plus the shoulder straps are all covered with fabric to ensure that they won’t be digging into your baby’s arms or crotch. The reason it tops our list is that despite it not being the most full-featured stroller, it gives excellent value and you won’t miss anything going with it. If you need the best umbrella stroller for travel, look no further. The 3D Lite umbrella stroller has large wheels, thus enabling you to walk with your baby even on tough terrains. They are also very sturdy and strong. The umbrella does a good job protecting your child from the sun, and that’s why it’s the best summer umbrella stroller. You’ll obviously take a few items with you and with this stroller, you might not need to have a separate bag as it has ample storage that’s also easy to access. The handles are perfect for tall parents, sturdy and comfortable. 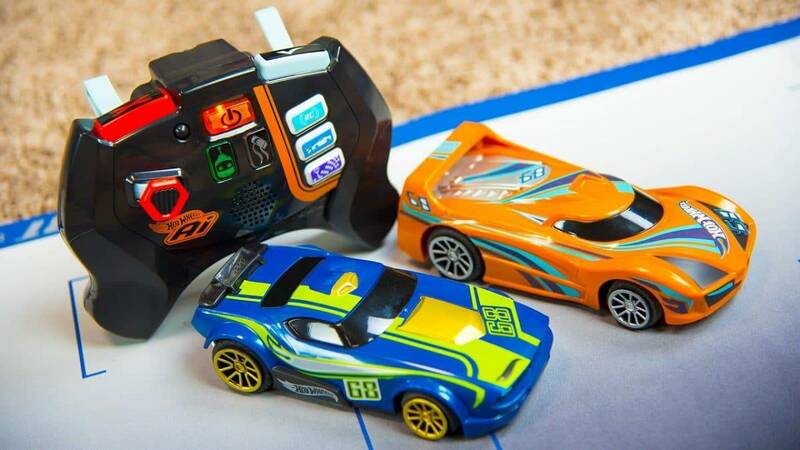 And, because the wheels are six inches, it’s pretty easy to turn and push. It folds easily, with one foot and one hand, and it’s also very compact once collapsed. It also has attached shoulder strap that makes it easy and comfortable to carry. It doesn’t have a peekaboo window. This means that you will have to stop and walk to the front to check on the baby. Why we like it: At 16 pounds, Joovy Groove Ultralight umbrella stroller is lightweight and what we even liked more is that it stands up on its own when folded. Again, it has a peekaboo window, so you won’t have to stop and walk around to the front each time you want to check on your little one. 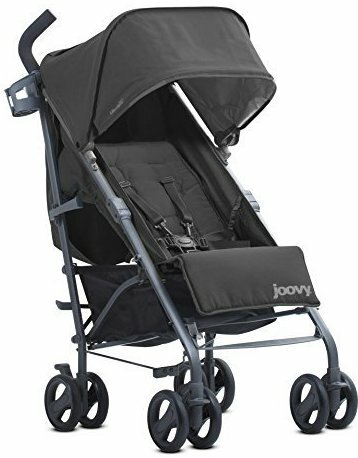 Just as the Summer Infant 3D Lite stroller, the Joovy New Groove Ultralight Umbrella Stroller has 6-inch wheels and even though it’s a little heavier, it’s so easy to maneuver on various terrains. It is also an excellent stroller for naps as it also reclines fully and into multiple positions. To even make it easier for you, this stroller stands up on its own once folded, and this makes it easy to open or store away. Again, the sun canopy in this is more generous compared to other options, and the storage is more versatile, so it’s a good product all-around. You hear most people say that they were only able to use their strollers for just a few months before the baby outgrew it. For the Groove Ultralight, it’s designed for use by babies at various ages, few months olds, and even toddlers. It has a mesh foot pocket. Thus you can recline it fully and safely use it for your newborn. The Infant 3D Lite doesn’t recline fully, neither does it have a mesh foot pocket, so it’s not safe for kids younger than six months. Again, the weight limit is 55 pounds, so 5 pounds higher than the Infant 3D Lite, and this means that you can use it just a little bit longer. The seat is nicely padded, and it’s roomy, so your baby will feel comfortable even being on it for an extended period. And, this stroller has an adjustable footrest, meaning any child will sit comfortably in it. Again, because it stands up on its own when folded, you won’t have to always bend to unhook the latch, thus making it a better choice for unfolding especially when you have the baby in your hands. About storage, the Groove Ultralight has enough to offer: a roomy storage basket, mesh seat pockets, and two cup holders. It’s heavy and more bulky (16 pounds). It’s also big when collapsed, thus needing large storage space. Why we like it: This is a great umbrella stroller for travel. It’s lightweight at just 9.5 pounds yet very sturdy. It’s very easy to carry around even with your baby on the other hand, and it folds compactly for easy storage. Folding is just a simple 1-step process and unfolding it is just as easy. It combines a rear hood with an extended sun canopy for the best sun coverage. It’s a great umbrella stroller for toddlers. The Kolcraft Cloud Lightweight is a simple umbrella stroller but has all the necessary features to make it ideal for a toddler. The seat is roomy and well-padded for the kid to sit comfortably and the canopy is well designed for your baby to sit under it without touching it. It’s large enough to offer good shade. The back is vented which is great. 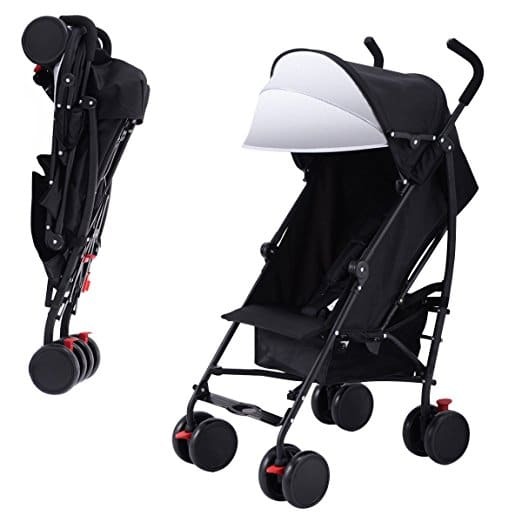 The stroller folds down easily into a small and light size, thus storing it away is easy. The hands are comfortable to use when strolling around with the baby and they also turn in for more comfort. They make it easy to push. The wheels lock too. The storage is enough for the necessary stuff. The underneath storage basket is easy to access and will hold quite some items and you also get a cup holder. The height of the handles is perfect for most tall people, and you will find them comfortable, and it’s also easy to steer with one hand. Why we like it: Delta Children LX Side by Side Tandem is the best Umbrella Stroller for twins though it’s for older children. It’s very sturdy, lightweight, and comfortable to push around. It reclines to ensure that your babies are in a comfortable position and the seats are nicely padded. It’s also the best twin umbrella stroller for the money. It has wheel locks that work perfectly, and the height is excellent for even tall people to have an easy time pushing it. The seats are nicely padded, and the straps are strong and comfortable for the babies. The only thing that could have been better is the shade. It’s a little bit small thus not serving the purpose correctly, but you can buy a bigger shade and attach to it. The best part is that you can still roll the stroller on the wheels once it’s folded or simply carry it because it’s lightweight. It has sturdy and adjustable footrest for the kids, and this makes it even more comfortable. The whole thing is very sturdy and even bigger kids will sit in it comfortably. Simply put, Delta Children LX Side by Side Tandem is the best double stroller for the money. The Delta Children LX Side by Side Tandem Umbrella Stroller is not fancy, but it gets the job done. It’s a great stroller for twins or just two kids. It’s super easy to fold, and it folds compactly for easy storage and unfolding it is so effortless. The way the Delta Children double umbrella stroller is designed, it’s definitely not meant for use by children who need head support because it’s wanting for really little kids unless you have a way of improvising it. It’s great for traveling because it has a compact size and super lightweight. It fits through doorways easily, and it’s easy to maneuver. Being a double stroller, this means that any parent who will be buying it will have much to carry every time and the manufacturers put this into consideration and ensured that each stroller has a storage net bag on the back. The bags are quite large, and they hold enough items for each kid and yours as well. It doesn’t have an underneath basket as most strollers, but the bags are really enough. The two canopies are too small to provide the best shade. Doesn’t have a peekaboo window. But its design allows one to keep an eye on the kids without it. Why we like it: : Graco Travelite umbrella stroller is lightweight, folds compactly and has a sturdy frame for durability. It’s very portable because it’s lightweight and has a comfortable shoulder strap to make transportation easy. We also liked the adjustable calf support and the multi-position reclining seat. Graco Travelite umbrella stroller gives your baby a comfortable ride due to the adjustable calf support. It also has a multi-position lean back seat that enables the baby to sit in a more comfortable position. Because of its adjustable features, this umbrella stroller can be used by kids of all ages as long as they are within the recommended weight limit. The seat is also nicely padded, and it feels very comfortable not forgetting the straps. When you need your child to sit comfortably upright, all you do is squeeze a plastic piece on the seat back, and then pull the straps and push the seat back to an upright position. The Graco Travelite stroller is very convenient for parents since it has Front-Swivel lockable wheels with suspension that makes it stable and easy-to-maneuver. 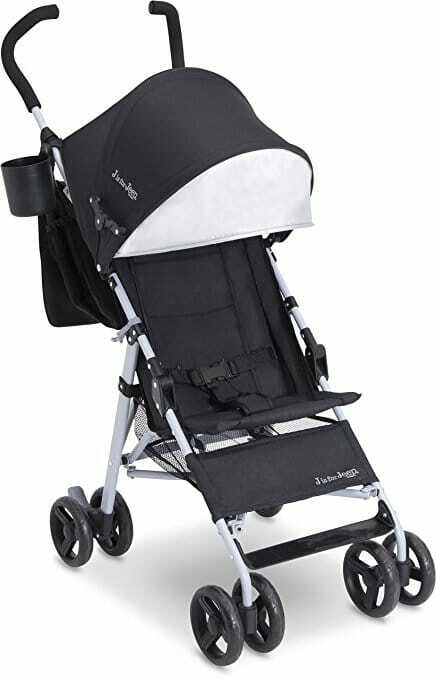 Additionally, the stroller has removable padded arm-bar that gives your child something to hold on to when strolling. This is great because most options don’t have it and sometimes one might get worried thinking that the baby will lean forward too much especially when dealing with a 3-point harness. This stroller is convenient and can move on gravel and sand. You just need to lock the front swivel travelite wheels. Graco Travelite has storage latch that ensures the stroller folds in a compact size when not in use thus making it portable and easy to store. 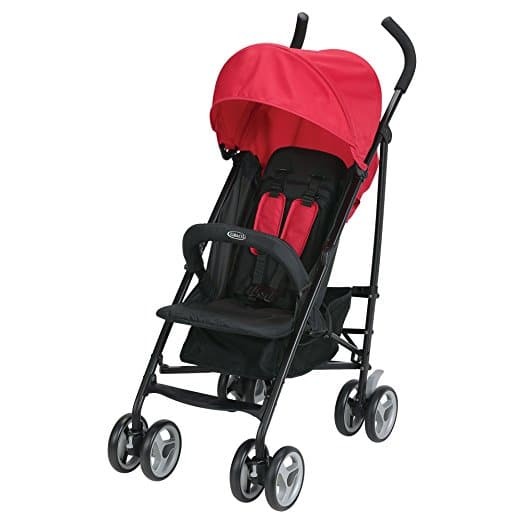 This stroller is lightweight, sturdy and has straps for quick and easy transport. This stroller has a large canopy that protects the child from the sun, and it’s easy to open and close. It’s a lightweight umbrella stroller with padded handles to offer a comfortable grip. The maximum weight for Graco Travelite umbrella stroller is 40 pounds, meaning it works for both toddlers and has room for big babies or kids wearing bunting or coats. The underneath basket is just enough to hold just what’s need when strolling with a little one. It’s an easy-access basket for holding and storing your travel essentials. It also has a parent cup holder. Why we like it: UPPAbaby G-LUXE Umbrella Stroller is a real definition of lightness and functionality. This stroller is agile, comfortable, feature packed, and fast. The UPPAbaby G-LUXE Umbrella Stroller is a new model stroller that is lightweight with an aluminum frame and one-action brake. There’s nothing about this stroller can weigh you down since it’s stable and fast. It literally moves with you. It has long handlebars which that give users of all heights a comfortable ride. It also has extendable sunshade with an SPF 50 plus. UPPAbaby G-LUXE Umbrella Stroller is made of one-step brake feature and durable wheels that make it a high performer. The wheels are 5.75 inches and make it easy to maneuver off curbs or boarding subways. With just a simple click, the stroller is brought to a gentle and safe stop. The stroller features a removable seat pad and easy to clean fabric. When spills happen, as they are bound to, you can easily remove everything, and machine wash it. It has a one-hand recline feature which ensures that your kid sleeps comfortably with an adjustable footrest. This stroller is ideal for quick trips as is has hand-level triggers for making sure it folds easily using just your fingers, and no foot action is required. It has a carry strap for convenient and easy transport, and also it’s easy to store since once it’s folded, it can stand on its own. 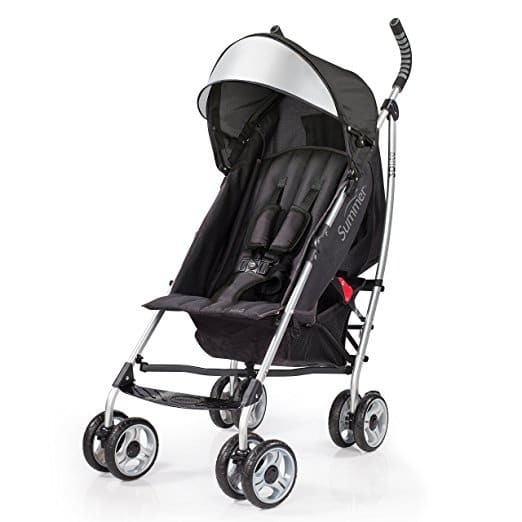 The stroller is also easy to open, has an adjustable canopy, and 4-wheel suspension. The UPPAbaby G-LUXE Umbrella Stroller has an underneath storage basket, very spacious and easily accessible. Why we like it: This is a great umbrella stroller with taller handlebars for the park or traveling. It’s easy to put together, and it folds down easily and compactly. It has a 3- point safety harness, footrest and calf support, and holds up to 40lbs. J is for Jeep is a versatile and secure umbrella stroller. It possesses suspension system for outstanding control and a front swivel wheel that keeps you prepared and ready for whatever adventure that comes your way. It has a 3-point harness for safety, footrest and calf support for the baby. This stroller also comes in handy with a storage basket underneath to ensure proper storage of your travel essentials. JPMA meets all the safety standards set by ASTM and CPSC. The J is for Jeep umbrella stroller has extra- long handles of about 40inches for users with different heights and easy but comfortable grip. It also has 5.5 inches back and front wheel for quick movements even on rough paths. It’s easy to assemble, lightweight, but with a sturdy frame for great portability. The maximum weight recommended is 40 lbs. 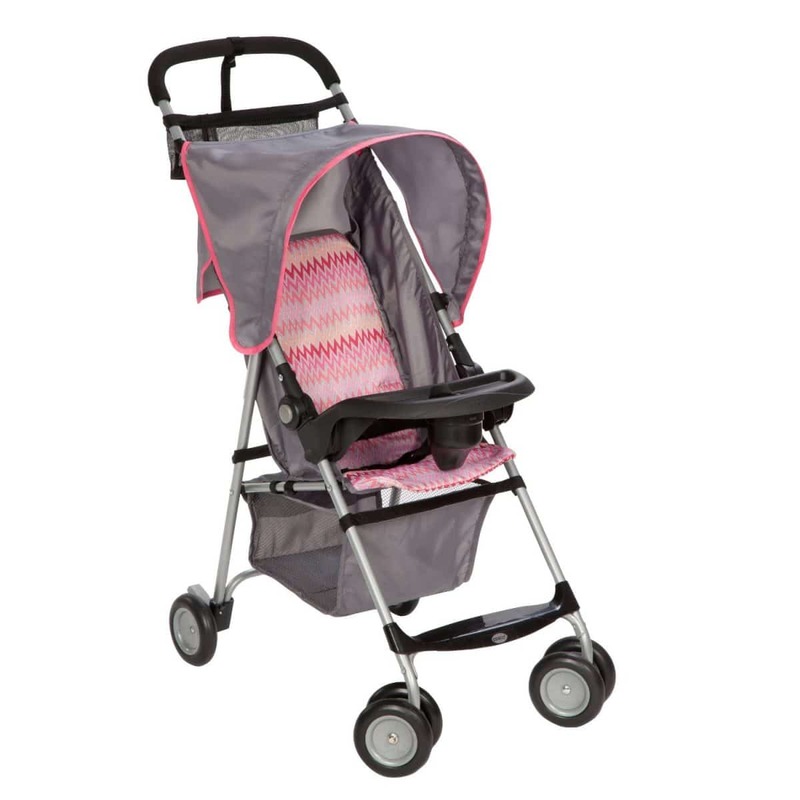 J is for Jeep Brand North Star Stroller is suitable for families and parents on the go. It is exceptionally convenient, comfortable and safe for your kid. It features extra –large canopy that is extendable to provide a sun visor for your kid which makes it comfortable to sit in even for more extended periods. It’s convenient for the parent since it has carry-all removable parent organizer that you hand at the back securely. This stroller’s seat is padded and turns up into a comfortable headrest that shows a mesh back which allows airflow, thus ensuring the baby is comfortable even during the warm seasons. The stroller has a storage basket, but it’s not so roomy so you might have to take just the essentials with you if you don’t want to carry an extra bag. It also has a parent cup holder for convenience. Why we like it: The Costzon umbrella stroller has a sturdy steel frame, its lightweight, has an adjustable canopy, and comes with a storage basket. It also has lockable rear wheels and a 3-point harness for safety. The Costzon umbrella stroller is a great stroller for travel because it’s very portable and generally designed to make traveling with a baby easy and comfortable. It’s lightweight, has a rear hood and an extended canopy for baby’s protection from rain and ultraviolet rays. It also boasts a comfortable PP cotton seat equipped with safety belt allowing the baby to wonder, rest and sleep in the stroller comfortably. It has a storage basket that is so convenient and ideal for holding diaper, purses, groceries, and bags. The handles are long enough and can be used by users with different heights. Costzon umbrella stroller is constructed of heavy-duty, quality steel frame that makes it strong to carry both toddlers and big babies safely. 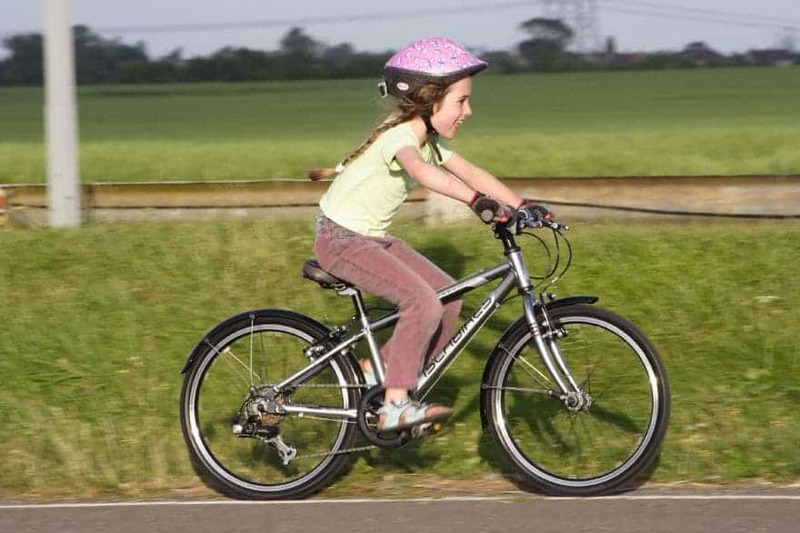 It can be used on rough and bumpy surfaces, and it also has lockable rear wheels that provide safety and flexibility for when you go out for an extended period with your baby. It’s also easy to operate thanks to the foot operated linked parking brakes. Its minimum weight recommendation is 5lbs and 33lbs maximum. It has a roomy and sturdy underneath storage basket where you can store your purse, groceries and baby diapers. Why we like it: This is a great umbrella stroller for the money. The canopy comes with a fun design, and the colors are also lively. It’s also compact and lightweight for portability and offers optimum comfort. 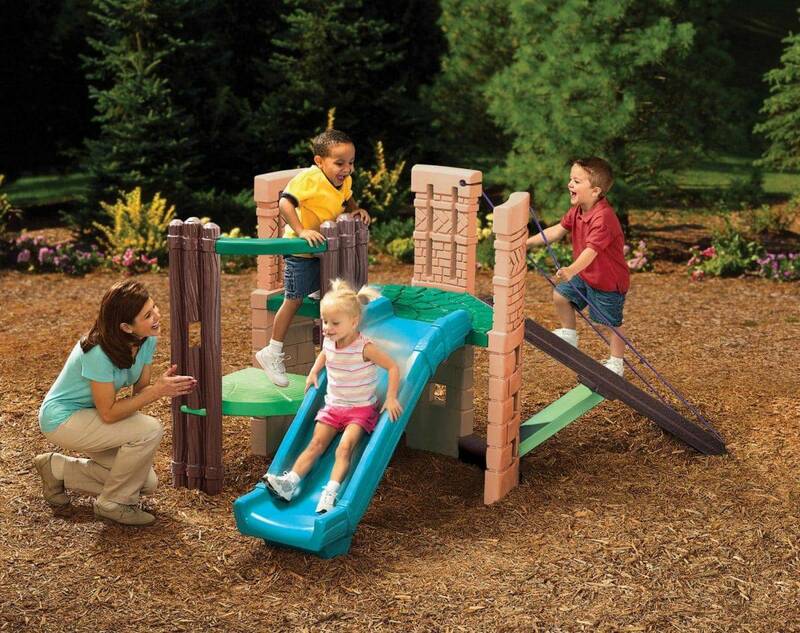 Again, it’s easy to assemble, and the construction is durable. 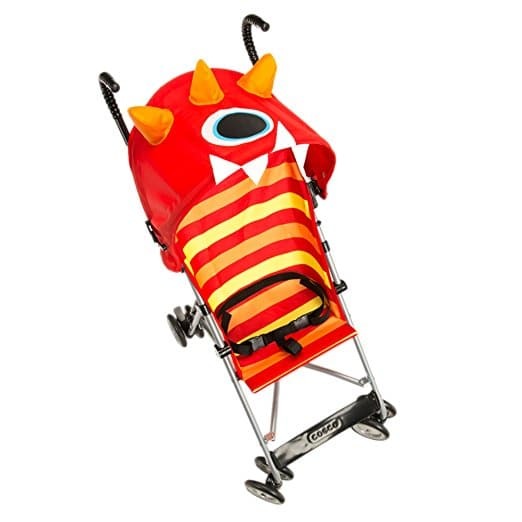 Cosco umbrella stroller is one of our favorites as it has a fun creature design that your kid will fall in love with. It is also very compact and lightweight hence easy to travel with. And, it folds down compactly when it’s not in use, and you can easily stow it away in the closet. Cosco umbrella stroller is very comfortable, not just for the baby, but for you as well. The handle design is impressive as they are covered to offer that desired comfy grip and every parent will appreciate this especially if you’ll be pushing the stroller around for more extended periods. This umbrella stroller has three-point straps that are heavy-duty to make sure that your baby is safe and comfortable even as you travel over bouncy or rough surfaces. It also has a footrest for your child’s comfort. There is nothing much involved in putting this stroller together, so it takes just a few minutes. Even people who have not assembled an umbrella stroller before will have an easy time. 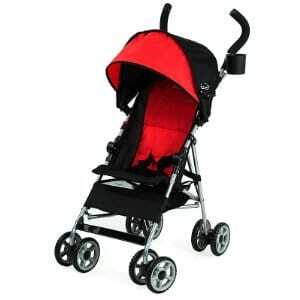 About durability, the first determinant when it comes to strollers is the frame, followed by wheels then the fabric. The Cosco umbrella stroller features a lightweight, but sturdy frame and it’s durable. The wheels are large and sturdy, and they make it easy to maneuver on various terrains. The canopy is enough to offer the needed protection from the sun, and the overall fabric is durable as well. It also has step-on-locks that make it stable and easy to stop. This stroller accommodates a child’s weight limit of up to 40 pounds, and as expected, there will be mess from time to time, so you need to keep it clean. Luckily, the fabric is easy to clean, and it dries up fast, and all you need is water, light soap, and a scrubbing brush or a cloth to clean and then leave it to air-dry. The stroller doesn’t have a storage basket. This means that you have to have a bag for anything that you might need to take along. If you are looking for an umbrella stroller to use on tough terrain, the Cosco Umbrella Stroller might not be the best choice. It’s a great stroller and will get the job done when on considerably smooth surfaces, but you might have a hard time handling tough terrains. Simply put, the quality of the wheels is wanting. Why we like it: It’s lightweight, folds and opens easily, 3-point harness and comfortable. Disney Umbrella stroller is very portable because it’s compact when folded and it folds easily. It is made of quality materials but remains relatively affordable. It weighs just 8.2 pounds, and this makes it easy to list or carry by hand. It’s a perfect stroller to carry to airports and public places, and also if you live in high-rise apartments, you have no worries as its light you can easily carry it up the stairs. The Disney umbrella stroller is easy to assemble, and it also unfolds easily which makes it a perfect companion when traveling. This stroller comes with a 3-point harness for basic protection and to make sure that your child is secure in it. The Umbrella stroller comes with padded handles that are very comfortable for a user to push. However, the handles are quite short though compared to other strollers making it suitable for parents who are only six feet tall or below. The stroller has an attractive design and kids fall in love with it since it has cartoon characters, Winnie the Pooh, Tigger, and Piglet and the fabric is printed. The Disney Umbrella stroller is very functional and has proper brake system. Though it’s lightweight, it can still accommodate kids who are up to 40 pounds. It’s best suitable for short errands and trips. This stroller doesn’t have a storage basket/bag, so you will need a bag for anything that you might be taking with you for those strolls. What do you need the stroller for? Short trips or longer trips? How often will you be using the stroller? What kind of terrain will you be using it on? How tall are you/your partner? How much will you be carrying? What’s the ideal storage size for you? Once you have the answers to the above questions, you will be a step ahead in narrowing down to the best umbrella stroller for your family. 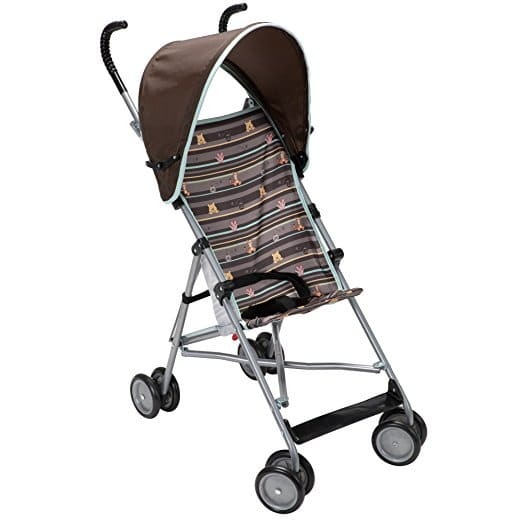 Umbrella strollers are designed to fill a gap in the market, one of which is the size issue. People looking for an umbrella stroller are obviously in need of a small, compact and lightweight stroller that serves its primary purpose perfectly while also being easy to fold, lift, carry, and store. For an umbrella stroller, size and weight should be proportional for stability. Some umbrella strollers have dual front wheels, that is, two front wheels on each front side. Before testing, this might seem like a good design, but it actually makes it hard to change terrain, and they easily get stuck in grass or deeper gravel. Umbrella strollers will either have a single action braking system or double action/two different pedals. Single action brake systems are easier to use simply because pressing one pedal is easier than two. For your own good, be keen on the braking system before buying any stroller. The best umbrella stroller should be easy to assemble, easy to use and of Corse, meet all your needs. Your baby should be comfortable and safe in it meaning, the seat, harnesses, back and head support, the canopy, etc. should be on point. Again, the storage should be enough and easily accessible, and the handles should not only offer a comfortable grip, they should be long enough to match your height. Another factor to consider when looking at its versatility is its weight limit. Check the lowest and the maximum weight limit to determine if it will serve you as you’d wish. Some umbrella strollers cannot safely accommodate new born or generally kids who cannot sit upright yet. Others have a small maximum weight limit meaning you will have to shop for another stroller soon when your baby outgrows it. How long will your little one be seated in stroller? This will best be answered by the type of trips you plan on taking. Some trips are short, and your baby will be in the stroller for a short period. Others are long, and you might have your baby in the stroller for several hours especially if you love all day treks. In the case where your baby will be in the stroller for a long time, ensure that the stroller has an adjustable leg rest and back to enable them sit and nap comfortably. The other thing is the size of the canopy. It should be long and extendable to provide a good shade on the extremely sunny days. The seat should also be nicely padded, and the harnesses should be comfortable. Also, ensure that the handles are ideal for long pushing trips because you don’t want to hurt your back or hands in the process. How often will you be taking the trips? If you are going to use the stroller for just a few times, there is no point in going with a high price tag. In such cases, look for a simple umbrella stroller because they are cheaper. However, if you will be using it frequently, it’s worth investing more to avoid disappointments. Because the market has so much to offer, it’s good to set a budget before starting the hunt. The best time to set the budget is after answering all the above questions because only then will you have a clear picture of what you want from the stroller. At a glance, all these umbrella strollers seem so similar, but looking keenly at each will definitely help in getting the differences. We have described the top ten best umbrella strollers for 2018 to help you have an easy time shopping. The good thing with this category of products is that there is something for everyone. But, remember to check out the recent research on any baby products to see the recommendations or how safe it is.